Check out Billboard’s exclusive premiere of JR JR’s “Dumb Myself Down” with their new label, Love Is EZ! The new song is apart of the Detroit duo’s upcoming Invocations/Conversations double album coming out May 31, 2019. Read the full article here, where JR JR's Joshua Epstein talks about the inspiration behind the song and the duo’s new label! Excited to share High Snobiety’s premire of Now, Now’s brand new single, “Enda” out now with Trans Records! The song is listed on the site’s recommended listening page, ensuring readers that the “dark magic” single is spiritually cleansing. Read the full article here! The Ninth Wave shared their music video for the single “Used To Be Yours”, premiered via Noisey Music who wrote that the band’s ”sound is a brilliant, bleak mixture of 80s rock bands like The Cure and Sonic Youth, but with a synth pop sheen – the kind of thing you might listen to while smoking in the bath and ruminating over past lovers if you were feeling particularly dramatic.” See it HERE and read an interview with the band. The New York Times gives their take on The Archives’ version of Gil Scott Heron’s “Home Is Where the Hatred Is” in this week’s Playlist, writing… “This version of ‘Home Is Where the Hatred Is,’ a testimonial of bleak addiction, trades in the edgy anxiety of Scott-Heron’s scurrying original for a sedate, dub-reggae flow. But Puma Ptah, a vocalist hailing from the U.S. Virgin Islands, holds onto the lyric’s core sense of pathos and frustration. Read more at The New York Times. Watch American Football rate Greta Van Fleet, Bradley Cooper and Celebrity ASMR on the latest episode of Pitchfork’s “Over/Under.” The band also talks about the New England Patriots and “Never Meant” memes! Be sure to watch the full video on Pitchfork! Check out the premire of Ryan Pollie’s music video for “Aim Slow” on NPR Music & All Songs TV! “Aim Slow” is the first single off of Pollie’s new self-titled album out on May 17th with ANTI- Records. The first single is already recieving praise, with NPR saying, “‘Aim Slow’ is a raw portrait of the fading of memories and loss of innocence that occurs with or without a life-changing diagnosis.” Ryan Pollie will be avalibe in stores and online via ANTI- Records on Friday, May 17 with pre-order available now! Check out Entertainment Weekly’s first look on Dave Hause’s new song ‘Saboteurs’ from his new upcoming album Kick, out April 12! Sarah Rodman describes ‘Saboteurs’ as, “Illustrating both the pervasive nature of fear and a determination to fight that fear, and how simply choosing to weather the storm with people you love can be an act of strength.” Read the full article on Entertainment Weekly! The Ninth Wave are in the middle of making their US debut this month, and Paste Magazine has named them one of “15 British Acts You Need To Know”. Read all about them and some other great music HERE! Hear American Football's new album on NPR Music's "First Listen"
American Football are back with their 3rd self-titled LP. It’s out next week, but you can listen early via NPR Music’s “First Listen”. Excited to share Galactic’s interview with NPR’s Weekend Edition Saturday! 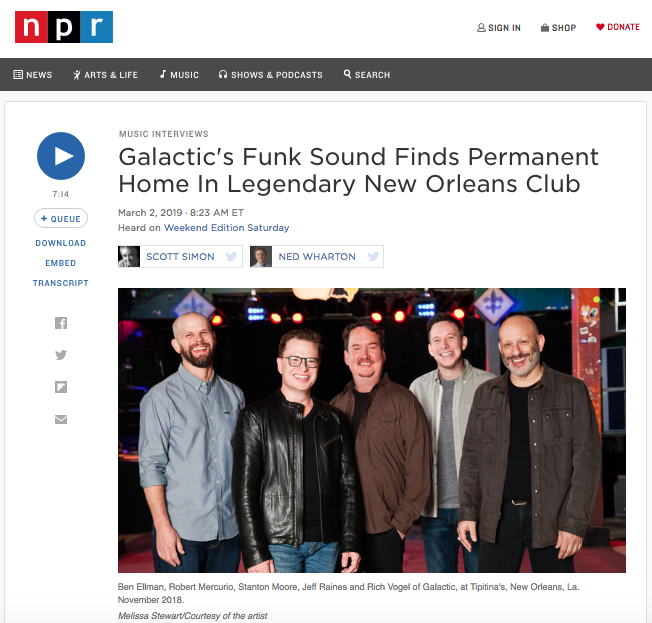 The interview features Galactic’s favorite venue to play at for over 25 years, Tipitina's in New Orleans. Check out the full interview on NPR! Thrilled to share Pitchfork’s review of Du Blonde’s latest album, Lung Bread for Daddy! On Beth Jeans Houghton’s second album, “the truth will set you free and make you queasy.” With Pitchfork’s Ben Hewitt saying, “Du Blonde sorts through the messiest aspects of desire and revulsion with cathartic finesse, purging her past while leaving her strange, spiky magic intact.” Read the full article on Pitchfork! Check out Noisey’s Blind Spots feature where Mike Kinsella of American Football reviews Vampire Weekend's 2008 debut album! Ahead of the release of American Football (LP3), the Owen and Cap’n Jazz veteran takes his first listen to the band’s self titled Vampire Weekend album, adding “Was this on the O.C. ?” Read the full article on Noisey! Clarion Call Media is thrilled to share Galactic’s feature on the cover of the April issue of DownBeat Magazine! Pick up a copy at your local newstand! Thrilled to share The Consequence of Sound’s latest article on Du Blonde’s new self directed music video for her single “Angel”, out now. The song is off her upcoming album Lung Bread for Daddy, coming out next month with Moshi Moshi Records. The single depicts the UK singer’s liberation from leaving an unhealthy relationship. Read the full piece here & watch the new video via YouTube! 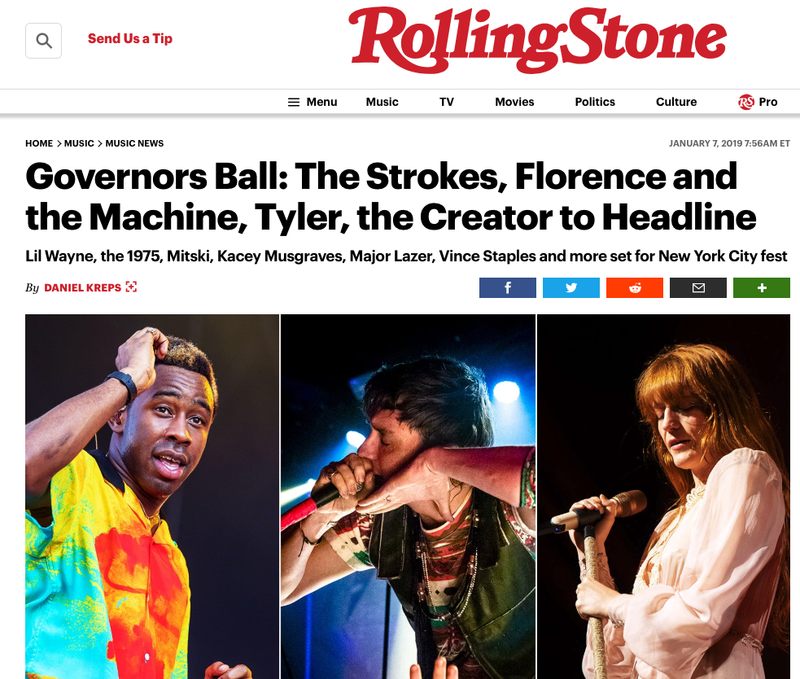 Governors Ball announces 2019 Lineup! The Governors Ball Music Festival has announced its 2019 lineup. Can’t wait to kick off summer in NYC with another amazing weekend of Music, Food and Art in the middle of the city that never sleeps. Head to Rolling Stone for more details. Pitchfork Has Included American Football’s upcoming March 22nd release in their “33 Albums We’re Most Excited for in 2019” list and we have to agree. Trust us when we say LP3 is going to be worth the wait! So exciting to share Galactic’s inclusion in The New York Times’ featured playlist from last week, among the company of Meek Mill, Jacob Collier, Cactus Blossoms, and many more. “Here’s nothing more or less than a euphoric three-minute New Orleans funk romp from one of the city’s long-running bands,” writes Jon Pareles on recent single “Clap Your Hands” feat. Miss Charm Taylor. Be sure to read the full roundup on The New York Times! 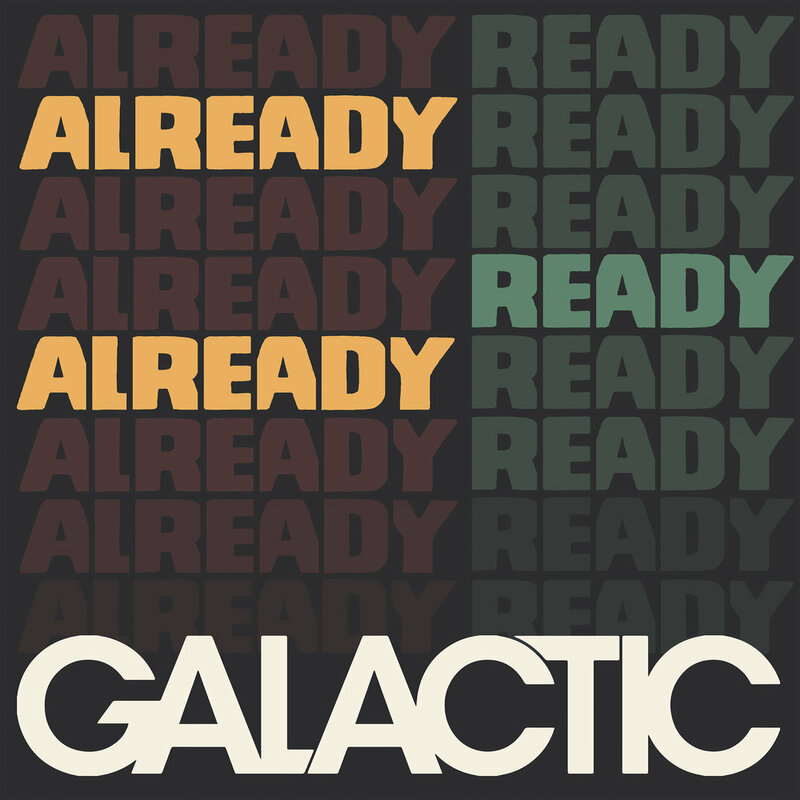 Galactic’s forthcoming record, Already Ready Already, is due out February 8, 2019 via Tchoup-Zilla Records. Thrilled to share Rolling Stone’s exclusive interview with American Football, who have just announced their forthcoming record, American Football (LP3), due out March 22, 2019 via Polyvinyl Record Co. “The iconic emo band boasts an evolved sound in third album,” Rolling Stone write, “featuring guest vocals by Hayley Williams, Rachel Goswell and Elizabeth Powell,” later adding that the band has “made obvious and intentional strides towards maturation.” Be sure to read the full interview via Rolling Stone & pre-order the record on Polyvinyl!